Visitors can trade their St Patrick’s Day novelty paraphernalia – costume hats, shamrock glasses, sparkly fascinators, leprechaun beards or tricolour boas – for free entry to EPIC, March 17th to 20th. 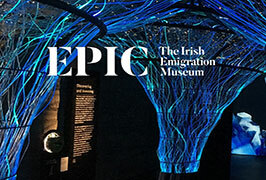 EPIC The Irish Emigration Museum finds a way to turn St. Patrick’s Day stereotypes into something with more substance. In the run up to St. Patrick’s Day, EPIC has launched a campaign challenging people to see beyond the St Patrick’s Day stereotypes of novelty green hats and leprechaun beards. In an effort to reframe the discussion around what it means to be Irish around St Patrick’s Day, they have launched a “There’s More To Ireland Than…” campaign centred around a stereotypes-for-substance ticket amnesty offer. From the 17th to the 20th of March, EPIC are inviting you to trade in your St Patrick’s Day novelty paraphernalia – costume hats, shamrock glasses, leprechaun beards or tricolour boas – and visit the museum during the St. Patrick’s Festival weekend to get a deeper understanding of the influence of the men and women who have left and learn more about what Ireland has given the world. Whether it’s the inventors, writers, musicians, architects or scientists, they want you to visit EPIC and discover what it really means to be Irish. This is about showing people that as well as the craic, the pints and the shamroguery, there’s more to Ireland than just stereotypes. EPIC are inviting people to the museum to get a deeper understanding of the men and women who have left and learn more about what Ireland has given the world through diaspora. February at EPIC they are delighted to welcome the Gymboree team to the Tiny Tots Tuesday! Bring your little ones along for a morning of music, dance and games in this lovely, interactive workshop on Tuesday 12th February. Participants at this event can also avail of a 20% discount on tickets to the museum and in the museum gift shop – simply show a staff member your Eventbrite ticket to avail of the offer. This March EPIC are celebrating Spring with Singaling and having not one, not two, not three… but four Tiny Tots Tuesdays! Taking place on 5th, 12th, 19th & 26th March, they will be exploring music and play in these adorable workshops, so bring your little one along for a morning of fun, song and dance. Join award-winning writer, Sarah Webb for this interactive sea-themed event for the whole family at EPIC The Irish Emigration Museum. Create your own colourful sailing ship, revisit favourite childhood rhymes and songs and discover new ones from Ireland and beyond. This event is suitable for children aged 0 to 4 Years. Adults do not require a ticket for this event. Children must be accompanied at all times. Recommended for ages 0 to 4 Years. This St. Patrick’s Festival we are celebrating storytelling at EPIC in this interactive story workshop with award-winning children’s writer Sarah Webb. There will be mapping, drawing and the chance to create your very own family underwater adventure story! Recommended for ages 8 + Years. Admission: – €8 – €16 Tickets also include entry to the museum. As part of St. Patrick’s Festival, Catherine McGuinness will be returning to the museum for a seriously slimy science lab. Come along, get creative, get a little green and learn something new in this fantastically disgusting workshop.